Research on a versatile bacterium provides insight into multicellular microbial life and tackling infections as deadly as those associated with cystic fibrosis. I’m a great believer that almost everything exciting in biology was invented by bacteria,” Dianne K. Newman, smiling, remarked earnestly to me. We sat in her spacious office at the Massachusetts Institute of Technology (MIT), where she then was a professor of biology and geobiology. She happened to be wearing a black Tshirt with a large portrait of Charles Darwin. Newman backed up her statement with an impressive list of basic components common to all cells, all created in bacteria first. They include many molecular pathways that allow cells to signal to each other (in times of growth or crisis, for example); central elements of the cell membrane critical for keeping the insides of cells separate from the outsides; and metabolism, the energetic foundation of every cell we know in plants and animals—even the yeast in your beer. While Newman’s excitement about all of bacteria’s innovations is contagious, a major focus of her research lab may at first sound less enthralling: trying to understand how a bacterium called Pseudomonas aeruginosa gets rid of waste byproducts from its energy-producing chemical reactions. Look deeper, though, and her research is revealing unexpected similarities between bacteria, which live as single cells, and far more complex multicelled organisms like ourselves, in biological pathways preserved through billions of years of evolution. Newman’s work is also uncovering tricks some bacteria have devised that allow them to live inside our bodies, sometimes causing disease. In ways both good and bad, our own well-being is linked to how bacteria began sorting things out eons ago. Lars Dietrich, at the time a postdoctoral fellow in Newman’s lab at MIT—he now runs his own lab at Columbia University—showed me a close-up picture of P. aeruginosa on his computer screen. A rod-shaped bacterium, it looks like a hot dog, but with distinctive stringy processes extending from its surface. These small strings, or pili, act as microscopic grappling hooks that enable the bacterium to move along moist surfaces. And at one end of the bacterium is a longer, thicker, single string, called a flagellum, whose motor-like action propels it through liquid environments. There’s no question that P. aeruginosa gets around—it’s found the world over in soil, in freshwater, and even on our skin. Among microbiologists, it has a reputation for being highly adapted to living in diverse environments, a range too stressful for most other bacteria. The natural toughness honed over many millions of years also makes the bacterium highly resistant to antibiotics, so it has a relatively easy time taking up residence in our bodies. Newman wasn’t drawn to study P. aeruginosa by its resilience in so many environments, however. What intrigued her was a molecule she suspected it used to rid itself of waste products—one that in effect came around to pick up the trash. To survive, all cells need energy, which they get from nutrients in the environment. As the nutrients are processed by enzymes, tiny molecular machines pass electrons around the cell, forming and breaking chemical bonds, which releases energy. Cells use this energy for everything, including maintaining their genes in good repair, making proteins, and moving about in their environments. But one consequence of each cycle of energy production in a bacterial cell is that the electrons build up, and the balance must be reset in order for the next cycle to proceed. Without some vehicle to remove waste, energy production eventually stagnates, leading to death of the cell. It’s a problem that all bacteria have solved, one way or another. When Newman was a postdoctoral fellow at Harvard Medical School, she became intrigued with the idea that bacteria could have devised a solution for dumping their excess electrons, with nearly no associated cost, by utilizing compounds already ubiquitous in their natural environments. That would be like getting the trash picked up for free. Oxygen, a superb “electron acceptor,” is a small molecule that easily enters bacterial cells, and it has been a great electron dump for many bacterial species for hundreds of millions of years. But there’s a catch: while today the atmosphere is oxygen rich, free oxygen was far less abundant earlier in Earth’s history. Therefore, the most ancient bacteria would have needed different electron dumps. And even now, some bacteria manage to thrive in places where oxygen is in short supply. Exhibiting a coordinated multicellular behavior called swarming, P. aeruginosa cells use their flagella to glide over the fluid surface of specialized agar plates. On the left is a normal strain; on the right is one incapable of producing phenazines. Minerals such as iron, which often abound where bacteria are found, also make great electron dumps. The problem is that iron’s mineral form, found in rocks, is far too big a molecule to enter bacterial cells, so electrons cannot be dumped onto iron molecules directly. Newman (who had earned her PhD in environmental engineering at MIT) set out to see how bacteria that thrive in iron-rich surroundings could transfer their excess electrons onto the mineral without it ever entering cells. She found evidence that Shewanella oneidensis, a bacterium that can live in environments lacking oxygen, could release a molecule to shuttle electrons from inside the cell to iron outside its outer membrane. After Newman set up her own lab, at the California Institute of Technology in Pasadena, she and her first graduate student, Mariu Hernandez, scoured the scientific literature for examples of known electron shuttles used by bacteria. They came across a class of molecules called phenazines. There isn’t much to the chemical structure of a phenazine: a row of three small carbon-based rings joined at their sides, a couple of nitrogen atoms here, an oxygen there. Those plain structures are perfectly formed, however, to swap electrons back and forth, picking them up on the inside of a cell and dropping them off on the outside. P. aeruginosa, it turns out, churns out phenazines by the bucketful, and Newman was hooked (at MIT she continued the research she began at Caltech, where she has since returned). Phenazine-like molecules may have enabled ancient bacteria to thrive in a low-oxygen environment. Indeed, phenazines that act as electron shuttles have been found within the cell membranes of some archaebacteria—microorganisms with cellular structures resembling those of bacteria, but with quite different toolboxes of genes and other molecules—that can live only in environments devoid of oxygen, such as deep below the Earth’s surface. Eventually, however, Earth’s atmosphere became oxygenrich, and that has persisted for hundreds of millions of years. P. aeruginosa produces at least four different kinds of phenazines, all capable of transferring electrons to both oxygen and iron (though with differing efficiency for those two different acceptors). That versatility may be one key to this bacterium’s resilience, enabling it to survive in a range of environments, some with limited oxygen. But in the case of oxygen—whose molecules can freely enter cells on their own—why the need for an intermediary shuttle? Many types of bacteria, including P. aeruginosa, can live in dense communities called “biofilms,” aggregates of cells held together by a meshwork of molecules they produce and release. Biofilms can live on artificial surfaces, such as plastics, but they thrive on organic material, including human tissue. Long before humans were around, such aggregates of bacteria were populating soil, aquatic environments, and almost everything in between. 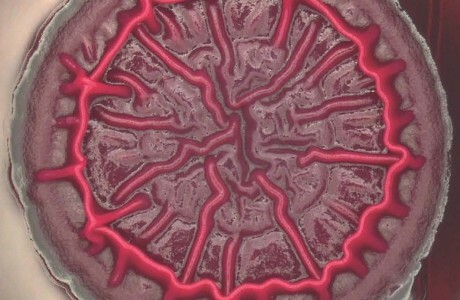 In biofilms the bacterial cells form layers so thick that cells in the most deeply embedded layers are starved for oxygen. For those cells, electron shuttles such as phenazines are a lifesaver, transporting their excess electrons to oxygen acceptors near the outer reaches of the biofilm. It’s very tempting to speculate that the phenazines we see operating today in biofilms are a carryover from ancient bacteria that inhabited an oxygen-poor atmosphere. Newman and Dietrich caution, however, that we do not know if phenazines are ancient. The best-studied phenazine produced by P. aeruginosa, called pyocyanin, can only be synthesized in the bacterial cell in the presence of oxygen, so this is likely to be a type of phenazine that arose after the Earth’s atmosphere became more oxygen rich. It is possible that the use of phenazine-like molecules as electron shuttles arose independently at multiple points during bacterial evolution. That they represent good solutions to a recurring problem is supported by the fact that they are found in bacterial and archaebacterial species that are not closely related to one another. And while they have served P. aeruginosa and other bacteria well as electron shuttles, it turns out that phenazines can do even more. Tall and intent, yet soft-spoken, Dietrich came from Germany to Newman’s lab excited by the notion of a single biological molecule serving multiple functions. Phenazines were a perfect case study, because it had been known for decades that they could act as antibiotics, a role very different from that of electron shuttle. When they react with oxygen near the surface of a P. aeruginosa colony, a new chemical species is produced that is toxic to other bacteria, but not to P. aeruginosa itself. In other words, phenazines can help the colony fight off competition. Single molecules adopting multiple roles in the cell is a signature of evolution. For a bacterial species to survive for many millions of years, outlasting its competitors, it has to use its resources as efficiently as possible, and one way to accomplish this is to have its own molecules multitask. It’s a process that is refined over countless generations and vast evolutionary timescales, with some experimentation failing, leading, in the worst case, to extinction. Luckily for the ancestors of P. aeruginosa, multitasking phenazines worked out well. Dietrich and others in the Newman lab sought to investigate whether phenazines have additional roles besides antibiotic and electron shuttle. When exposed to air, phenazines come alive with color. To demonstrate this to me, Dietrich vigorously shook a liquid culture of P. aeruginosa in a glass test tube. The upper portion of the medium transformed from its normal light-yellow color into brilliant blue-green. 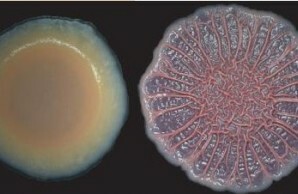 The color transformation results from the exposure of the phenazine pyocyanin to oxygen near the surface of the liquid, an effect that dims gradually through the culture, forming a gradient. When pyocyanin scoops up excess electrons inside the P. aeruginosa cells, it is colorless, but dumping the electrons onto oxygen outside yields the flash of color. The color gradient signifies how close cells lie to the oxygen-rich portions of the test tube. Dietrich then let the tube settle, reducing its aeration and thus exposure to oxygen, and within seconds the entire culture turned yellow again. Since that color-producing reaction could be started and stopped repeatedly, Dietrich reasoned that pyocyanin and the other phenazines were being recycled by P. aeruginosa—that after they dropped off electrons onto oxygen outside, they could easily reenter cells to be reused. The question for Dietrich was whether, upon re-entry, phenazines might be telling the cell about how much oxygen was available outside. He discovered that when P. aeruginosa cells were flooded with phenazines, a distinct set of genes was turned on, indicating that the molecules acted as important signals for the cell. This provided another intriguing example of a phenomenon only recently discovered in microbiology. 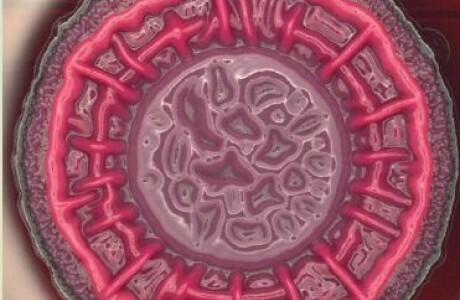 Until fairly recently, most biologists thought of bacteria as a collection of single cells, each acting independently. But numerous examples of cell-to-cell communication between bacteria, via small molecules they release, have been observed—first and foremost “quorum sensing,” which alerts bacteria to the presence of a threshold concentration of their fellows. At that signal, they turn on genes that enable them to emit a variety of other communal signals. 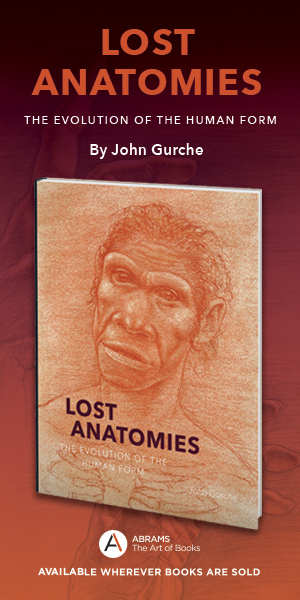 [see online http://www.nhmag.com/features/252011/tiny-conspiracies and in print “Tiny Conspiracies,” May 2001]. Thus bacterial cells, when assembled in sufficient numbers, can communicate with each other in ways similar to the cells in multicellular organisms such as plants and animals. Dietrich wondered how the large-scale release of phenazines by many P. aeruginosa cells could impact a whole community. When he placed a drop of a normal strain of P. aeruginosa onto a petri dish containing a nutrient-rich gel mixture, after several days it formed a smooth, perfectly round, semitranslucent colony. When he repeated this experiment using instead a strain of P. aeruginosa that lacked the ability to produce phenazines, it resulted, he said, in an “enormous change in morphology.” Instead of smooth and round colonies, the phenazine-less P. aeruginosa cells formed highly complex structures with irregular concentric rings and spokes radiating outward, like a spiderweb. Since those cells lacked an electron shuttle to transport their excess electrons outside to oxygen at the colony surface, they were forced to adopt such radical structures to maximize every cell’s direct access to oxygen. In the absence of phenazines that—through specific genes—signal to each P. aeruginosa cell that “everything is OK,” the cells regroup for survival. Not in an individualistic, “every cell for itself” way, but instead as a whole community, like a multicelled organism. Some cells push up, forming tall ridges that rise into the air like skyscrapers; others spread out thinly, like an oil slick. To adopt the complex vertical structures, cells secrete sugar molecules that make a durable scaffold onto which they can climb up and brace themselves, like children clinging to a jungle gym. That every movement is programmed to maximize each cell’s access to oxygen is a hypothesis favored by Dietrich and Newman. 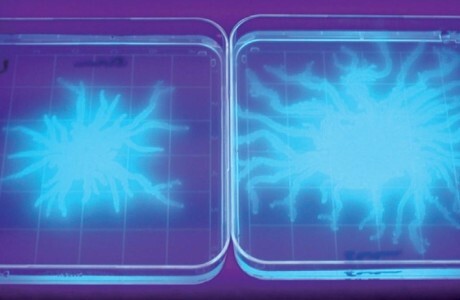 This safetyin-numbers mentality has helped P. aeruginosa and its ancestors weather long periods of evolutionary history, and it also provided the groundwork for multicellularity, in which neighboring cells depend on one another for survival. Dietrich further challenges his subjects by making a double-mutant strain of P. aeruginosa that can neither make phenazines nor sugar scaffolds. In the absence of a phenazine signal, cells buried deep in a colony sense that they must get closer to air, and so they start to make sugar scaffolds. If they also lack the capacity to produce scaffolds, the unique morphology that maximizes oxygen exposure is lost, and the double mutants likely stand much less chance of survival than even their singlemutant counterparts. Prime-time network television presented Dietrich with his next experiment. “Once I was watching CSI,” he says, “and I saw this really cool microscope.” It was a digital microscope that can produce super–high resolution images of microscopic particles, detailed enough to map the three-dimensional terrain of their surfaces. Dietrich ordered one for the lab, and the new microscope allowed him to visualize the surfaces of the oxygen-starved P. aeruginosa colonies—with stunning results. The ridges and rings that had appeared mostly flat in previous photographs were now transformed into an alien landscape of dramatic mountains and valleys, studded with scores of large rocks—P. aeruginosa cells scattered atop their sugar scaffolds. Not surprisingly, one of the P. aeruginosa genes affected by phenazines produces a protein that is likely involved in sensing oxygen—either directly, or indirectly by measuring something else in the cell that is affected by oxygen. Dietrich and graduate students in his lab are now testing whether this is the case. Intriguingly, these types of oxygen-sensing proteins are so good at their job that similar versions are also found in animals and plants. These proteins are critical in organs and tissues where oxygen can be at a premium, and must be sensed carefully, such as in the developing roots of plants and the developing lungs of mammals. Our lungs are composed of highly intricate networks of cells that maximize their exposure to the oxygen that must be delivered to the rest of our organs via the blood. The oxygen-sensing proteins are also necessary for tumor growth. As a tumor mass enlarges uncontrolled in the body, its innermost cells must be able to sense low oxygen, so that they can react by supplying themselves with blood-vessel “plumbing” to bring crucial oxygen needed for further growth. This process of angiogenesis is analogous to the morphological changes undertaken by oxygen-starved P. aeruginosa colonies. The idea that a protein required for a bacterial colony to survive in a low-oxygen atmosphere could have been hijacked by cancerous tumors demands further testing, but if true, would be a prime example of how basic microbiological research can enlighten us about Earth’s life history, evolution, and our own bodies. Opportunism can be a boon for evolutionary success—the more adaptable a species is, the greater its chance of survival—and P. aeruginosa and its phenazines saw a great opportunity in us. P. aeruginosa comfortably takes up residence in the human body and on our skin, but it generally doesn’t present us with much of a threat. The bacterium can become pathogenic, however, if, after entering our airways, it starts forming biofilms in the naturally occurring protective mucus of our lungs. Usually this still isn’t a problem, as our bodies have mechanisms to dislodge mucus from the lungs. Occasionally, however, these mechanisms fail us—for example, in the case of cystic fibrosis (CF). CF is a heritable disease that results from a mutation in a gene called CFTR that regulates ion balance in our cells. The mutated CFTR gene produces a defective protein that impairs water transport across cell membranes, making mucus abnormally thick and sticky and compromising the lungs’ ability to dislodge it. P. aeruginosa takes advantage by invading the excess mucus and forming colonies inside our lungs. While antibiotics have dramatically increased the life expectancy of CF patients, P. aeruginosa and other bacteria in the mucus eventually acquire resistance, and continued chronic infections usually lead to a sufferer’s death by the age of forty. Physicians can diagnose a P. aeruginosa infection in CF patients by the telltale presence of the phenazine pyocyanin’s blue-green tint in the mucus. P. aeruginosa could be relying on its phenazines to survive in the mucus, since cells buried deep in a colony would have less access to oxygen. Therefore, attacking the phenazines could cripple P. aeruginosa in these environments. In collaboration with physicians at Children’s Hospital Boston and Children’s Hospital Los Angeles, graduate students and postdoctoral researchers in the Newman lab are testing whether phenazines are a lifeline for P. aeruginosa in lung mucus. Working with clinicians in Boston, who obtained mucus samples from a large number of CF patients, they found “a striking correlation between the amount of phenazine in the lung mucus and the rate of decline of patient health,” according to Newman. Even if abundant in these infections, however, phenazines can only function effectively as electron shuttles if there is something else in the lung environment to dump their electrons onto, so they can be recycled back into the P. aeruginosa cells to pick up more. Oxygen is again limited, but there is iron in the lung that can receive electrons from phenazines. One important source is the iron attached to lactoferrin, a human protein that is part of our immune system. The wide exchange of electrons between phenazines, iron, and other substances could modify the chemical environment in the CF lung, and Newman’s lab and clinicians at Children’s Hospital Los Angeles are now studying how P. aeruginosa might adapt to these changes over the course of an infection. If the researchers can demonstrate that P. aeruginosa utilizes its phenazines to survive within the CF lung, they could then start to develop inhibitors of phenazine production or electron shuttling, with the hope of eventually testing these compounds in patients. Targeting signaling molecules such as phenazines that are released by bacteria could complement the use of antibiotics that target bacterial cells directly. This model may inspire similar courses of treatment for bacterial infections in other contexts. Newman, who is also a Howard Hughes Medical Institute investigator, hopes her lab’s research will change the way we think about the microenvironments of bacterial infections, and how molecules that bacteria secrete, such as phenazines, can modulate their own growth behavior in a colony—and potentially even that of other bacterial species that are part of the same community. To devise better treatments for diseases like CF, scientists must not only understand what goes on inside each bacterial cell, but also how cells talk to each other, exchanging information that allows them to survive together, like a multicellular organism. Bacteria have lived on Earth for hundreds of millions of years longer than any complex multicellular life form. By adopting an evolutionarily informed approach to understanding how P. aeruginosa solved a basic problem in energy production, Newman and her colleagues are unraveling deep connections to the emergence of multicellular life and the formation of complex organs, and offering new insights into potential treatments for cystic fibrosis. 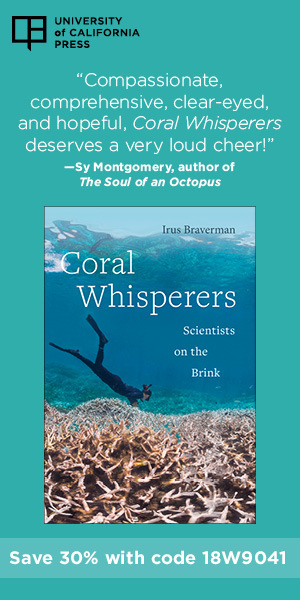 With reassuring frequency, the thread of evolution connects even the most seemingly unrelated biological phenomena, enabling us to advance our understanding not only of natural history, but of our own bodies, too.